Mighty Missouri Coffee is a staple at Coteau des Prairies Lodge. In fact, we just got in a shipment of fresh roasted beans and we want to share the java love. The lucky winner of this giveaway will win the five items you see in the picture above: The Mighty Series (Mighty Morning, Mighty Mo, Mighty Moonrise), a super comfy Mighty Missouri Coffee Company t-shirt and a Coteau des Prairies Lodge Mug. 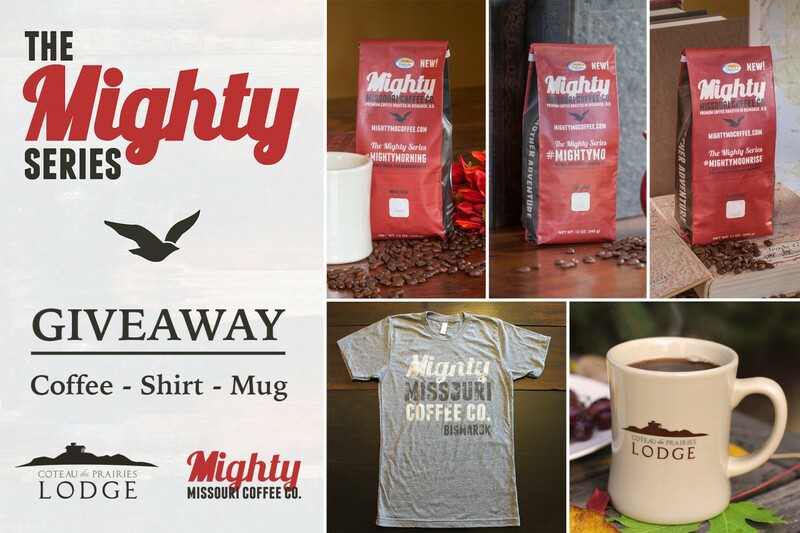 Thank you to Mighty Missouri Coffee for partnering with us for this terrific giveaway! The giveaway will be open until 11:59 pm Thursday, June 5th, 2014. Winner will be announced on Friday, June 6th, 2014. Love a good cup of coffee! With a little bit of cream! Thanks for the chance! I will enjoy a cup of Mighty Mo with fellow coworkers. I will enjoy a cup of this Mighty Mo coffee in the morning when my 16 month old is getting me up or i’m trying to get up before him. Coffee definitely helps this mom out a lot in the early morning before the day is in full swing. I would enjoy this coffee in the morning on the front porch with a little sugar and cream! I would enjoy the coffee on my back porch in the morning under the sun after it’s been brewed in my personal french press. I will enjoy it in my coffee maker when i get up and then off to check daily e-mail, then off to work! I will be enjoying it at work. I take it with a little cream and no sugar. Coffee is my go-to every morning…I love it!